Bayview Hotel & Apartments is centrally located in Gzira, walking distance from Duck Village and close to Bisazza Street. 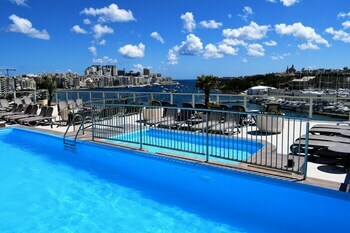 This family-friendly hotel is within close proximity of Sliema Promenade and Sliema Ferry. Make yourself at home in one of the 135 air-conditioned guestrooms. Wireless Internet access (surcharge) keeps you connected, and satellite programming is available for your entertainment. Private bathrooms with shower/tub combinations feature complimentary toiletries and hair dryers. Conveniences include phones, as well as complimentary bottled water and in-room massages. Take advantage of recreational opportunities offered, including an outdoor pool, an indoor pool, and a spa tub. Additional features at this hotel include wireless Internet access (surcharge), babysitting/childcare (surcharge), and an arcade/game room. Getting to nearby attractions is a breeze with the area shuttle (surcharge). Grab a bite to eat at one of the hotel's dining establishments, which include 3 restaurants and a coffee shop/caf�. Relax with your favorite drink at a bar/lounge or a poolside bar. Grab a bite to eat at one of the hotels dining establishments, which include 3 restaurants and a coffee shop/cafe. Relax with your favorite drink at a bar/lounge or a poolside bar. An indoor pool, an outdoor pool, a childrens pool, and a spa tub are on site. Other recreational amenities include a sauna and a 24-hour fitness center.